The Gray Ghost was based on the real-life military career of the legendary Confederate hero Major John Singleton Mosby, whose daring exploits and elusive raids of the Yankee forces in Virginia earned him the nick name “Gray Ghost.” This rare TV classic was devoted to duty, honor and love of country. Tod Andrews starred as Major Mosby. Also starring Phil Chambers. 1957-58. The Gray Ghost only lasted one season. Volume One includes the Trailer Promo and three complete episodes. 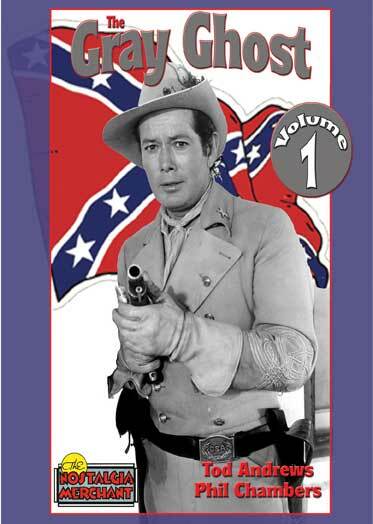 URGENT: This rare TV Classic could be withdrawn at any time and could be banned forever due to it’s politically incorrect content dealing with the Confederacy, the Confederate (Rebel)flag, and because it honors a Civil War hero. These episodes are excellent quality film transfers.